How Long Does Methadone Stay in Your System, Saliva, Blood Urine? The half-life of methadone is 8-59 hours, which means that one might need between 1.83 and 13.52 days to get the drug out of their system. Many factors can affect the duration and the elimination of the drug. Dosage, age, body mass, metabolic rates, and diet are among the variables that affect methadone and its effects. Can drug tests detect methadone? As methadone is a potent opioid, various tests can find the drug in your system. Urine tests are the most popular technique that can detect the drug for up to 2-4 days. Blood and swab tests can detect the drug within 30 minutes after intake, up to few days. Hair tests also detect methadone, up to 90 days. Methadone is a potent synthetic opioid, which doctors only use in various maintenance programs. At the same time, the drug is easy to abuse due to its recreational properties. It’s important to know how long the drug stays in the system as many users get hooked on it hoping to get clean from other opiates. Many deal with its painful withdrawal symptoms and thousands of addicted women use it during pregnancy. Usually, users can feel the effects of methadone within eight hours. However, its full effects do not begin for about 3-5 days of treatment. The drug has a half-life of 8-59 hours, which means that one will need between 2 and 14 days to get clean. Methadone is very powerful, and peak plasma concentrations occur within four hours. However, the drug is still in the blood even 30 minutes after intake and up to a few days. How Long Does Methadone Stay in Your Saliva? Oral samples also can detect methadone, and just like blood tests, they can detect the drug in 30 minutes and up to a few days after ingestion. How Long Does Methadone Stay in Your Hair? Although it takes some time for methadone to accumulate in hair segments, professionals can detect regular use via hair tests, with a detection window of up to 90 days. How Long Does Methadone Stay In Your Urine? As the drug excretes through urine, urinalysis is the most preferred method for the detection of methadone. Usually, the drug can remain in one’s urine between two and four days. As stated above, the range of methadone half-life is broad. That’s because many factors affect the duration and the elimination of the drug. Dosage: Greater amounts of methadone will excrete slower. Frequency: Frequent use will lead to increased accumulation of the drug in the body. The way of administration: Injecting leads to a quicker peak. Note that injecting methadone can also lead to vein thrombosis and infections. Age: Users over 65 metabolize the drug at lower rates. Body mass: As methadone accumulates in fat deposits, users that weigh less will remove from their system quicker. The health of the user: Problems with the liver and the kidneys may result in slow elimination. Genetics: Some genes can affect the metabolic rates of the user, resulting in rapid or slow metabolizers. Lifestyle: Specific diet may affect the duration and elimination of the drug. For instance, acidic meals may lead to quicker excretion. 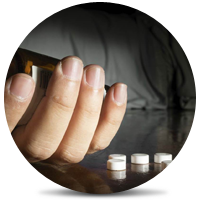 Polydrug abuse: Do not forget that mixing methadone with other drugs is dangerous as it may lead to an overdose. Other drugs may affect the chemical balance, resulting in a slow elimination. It’s important to say that pregnant women can clear their system quicker than non-pregnant. Information on the topic is vital as many addicted pregnant women use methadone during pregnancy. Like other substances, the drug undergoes liver metabolism. Multiple enzymes are involved in the process. Most of the drug eliminates through urine and small amounts through sweat and feces. Various tests can be used to detect methadone. Urine tests are among the most reliable techniques to detect the drug, for up to 2-4 days. The cut-off levels are at 300ng/mL. Some people claim that the drug can be detectable for up to two weeks after intake. Blood tests are not so standard when it comes to methadone detection. Still, they can detect the drug as soon as 30 minutes for up to few days. Swab tests have similar detection times, but unlike blood tests, they are noninvasive and quick. Hair tests can also detect Methadone. With time, methadone accumulates in hair samples. Note that hair tests provide a long window of detection, up to 90 days. In conclusion, tests can detect methadone. Last but not least, the drug is habit-forming. If you are trying to quit, consider tapering down instead of going cold turkey. Here you can find the best rehab for you or your loved one. Pain-free and sober life is possible! Addiction Resource » Addictive Substances: The Anatomy of Drug Addiction » Methadone Addiction and Treatment » How Long Does Methadone Stay in Your System? I was on methadone for almost 5 years. It helped after a major adominal surgery and me becoming addicted too opiods. My advice is. Be firm with your addiction doctor when on methadone. It took me almost 3 years too find a doctor who supported me getting off methadone and not prolonged treatments. I am now clean an feel 100% healthier.. I have my last treatment doctor too thank. I take 40mls of methadone per day and recently was drug tested and in my urine 69mls was detected? Is this because methadone stays in your body longer than 1 day? methadone has a half-life of 72 hour. so that means 72 hours after dosing, you still have half of the dose in your system.